The Elegante series has consistently been one of Pearl's best-selling instruments due to handmade workmanship, precise intonation, and a brilliant and projecting sound. 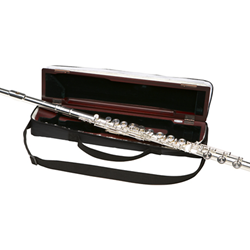 For over a decade, the Elegante has provided countless flute players with unrivalled confidence. Elegante model flutes are fully equipped for advanced players including as a standard configuration, the Forza headjoint enabling superior projection, increased dynamic spectrum, unrivalled clarity of articulation and dazzling rich tone. Largo headjoint option is also available for the Elegante Series which offers a traditional response, with a melodious and sweet character. All Elegante models comes in a professional wooden case.